Founded in 1756, in the Pfalz region of Germany, the J.L. Wolf estate (now called Villa Wolf) was a successful and highly regarded winery for more than two centuries. It entered an especially glamorous era with the construction of its Italianate estate house and villa in 1843. In the latter years of the 20th century, however, the estate languished, lacking a firm hand to guide its wine production. Ernst Loosen, of the Dr. Loosen estate, took over the vineyards in 1996, launching a dramatic turnaround in the estate’s quality and reputation. Since 2011, the estate has been managed by a talented and dedicated young couple who met while working at Dr. Loosen. Patrick Moellendorf and Sumi Gebauer have brought renewed energy and focus to the viticulture and winemaking at Villa Wolf. 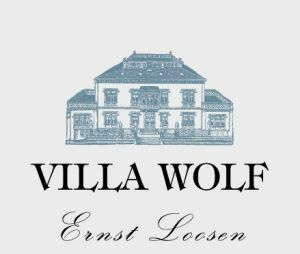 The goal at Villa Wolf is to produce wines that express the pure, authentic terroir of the Pfalz. Made in the classic style of the Pfalz, Villa Wolf Rieslings are drier and more full-bodied than Mosel Rieslings, with fully ripe fruit flavors and a characteristic stoniness in the aroma. The Pfalz region also has a long tradition with other grape varieties, allowing Ernst and his team to expand their winemaking palette to include Pinot Blanc, Pinot Gris, Pinot Noir, Gewürztraminer and Dornfelder. To preserve the naturally high quality of the vineyards, we employ sustainable viticultural practices and emphasize gentle handling of the fruit through traditional, minimalist winemaking.